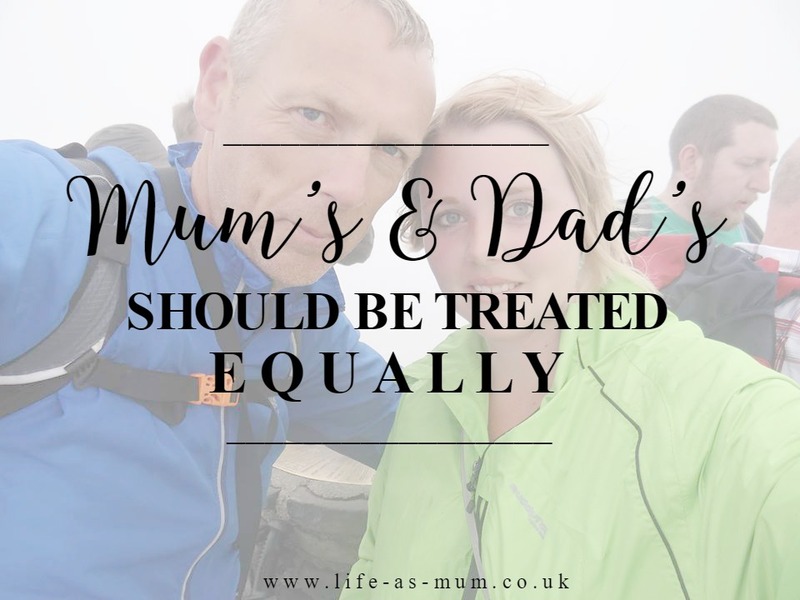 Mum's And Dad's Should Be Treated Equally! This is a post I have been wanting to write for a very long time but as it is coming up to Father's Day and realising that neither of my girls made Father's Day cards this year at school, I thought this was the perfect time to write this post. I was brought up by my Dad from a very young age and my Mam was in and out of my life, she still is. Shockingly (to some) there are many other people out there with single Dad's too. I have no idea to why a Mum should be more important than a Dad? My eldest daughter's Dad didn't step up to the mark for a few months after she was born but that didn't make me go against all Dad's as I know there are Mum's out there who are like that too. So why Mums should be treated differently to Dad's, I don't know. It is wrong on all levels. Some Mums actually think they have the right to stop the child's Dad from seeing them. What makes them think they have this 'power'? For one, you wouldn't of had the child if it wasn't for him. I understand that there are many Dad's out there who do bugger all for their child and it's sick and wrong that they can do that. But why can't people understand that there are a lot of Mum's out there who do bugger all for their child and decide not to be in their life. When it comes to nurseries and school I understand it can be hard when it comes to Mother's Day and Father's Day but what I really don't understand is how can some nurseries and schools let the children make gifts, cards and afternoon teas/parties for Mother's Day but not Father's Day. What is right in all that? What about the children who have no Mum or a Mum who's useless. There are many ways you can balance it out on Mother's and Father's Day. All children be involved in the activity and teachers, nursery workers and anyone else in the placement should know about the child's family and they can work around who needs to write Dad/Mum or Someone Special, for example. There are many ways to go about it instead of not doing anything at all. When I worked in a nursery a few years ago, I planned to do some Father's Day cards but my boss and a few staff members told me not to because there was a couple of children with no Dad in their life. But what happened Mother's Day? They all did a card, no problem. It's wrong. I really do think if nurseries and schools stop making Father's Day gifts and cards then Mother's Day should be stopped too. Treat them both equally or don't do it at all. There are many decent Dad's out there who are fighting to see their child but some Mum's think they have the right to stop them seeing their own child and it can also happen the other way too. Mum's and Dad's should be treated equally at all times. Neither one is better than the other. I would really love your opinion on this. It's not just about Father's and Mother's day cards and gifts, there's everything else too. I am a Mother myself, and have been a single Mother too and I would never think I am better than a Dad who deserves the name Dad! My Mother doesn't deserve the name Mam but my Dad does deserve the name Dad.